An all Alberta grain lager, and proud of it! Tasting Notes: A rounded malty lager showcasing Newdale barley from Hamill Farms via Canada Malting, Red Shed Malting and Last Best Brewing & Distilling. Due to the variety of Alberta malts, this bock finishes sweet while maintaining a hearty flavour profile. Bock Chain is a collaboration project bringing together Canada’s agricultural and technology industries. From farm to can, ingredients are traced using blockchain technology. 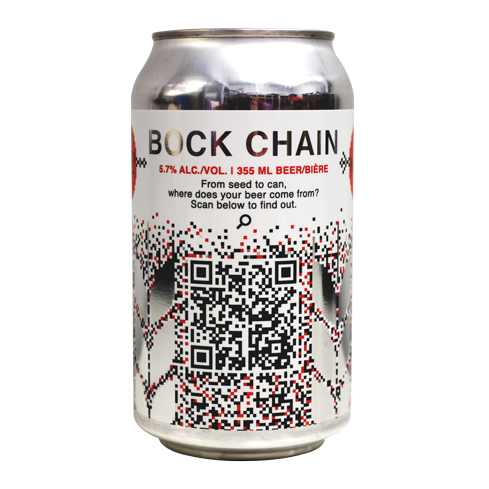 Simply use the QR code found directly on the label, and #UnlocktheBock! You’ll be directed to a site created by TE-FOOD which guides you through the entire farming, malting, and brewing process. This beer is only around for a limited time, so grab a pack while it lasts!